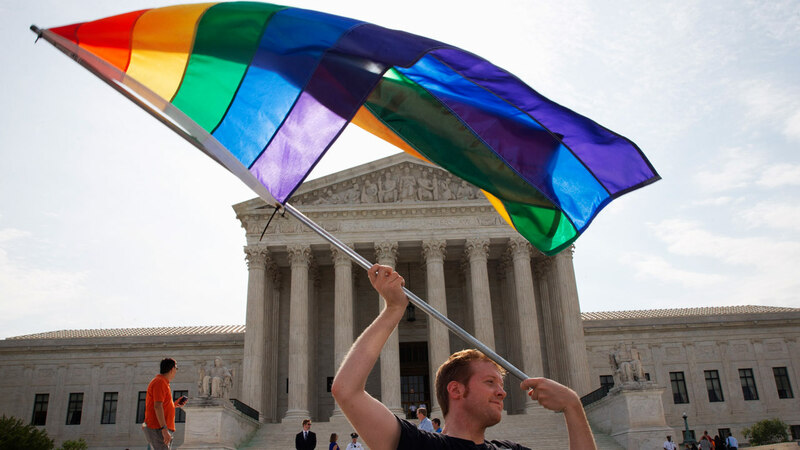 John Becker, 30, of Silver Spring, Md., waves a rainbow flag in support of gay marriage outside of the Supreme Court in Washington, Thursday June 25, 2015. ATLANTA, GA -- Georgia Gov. Nathan Deal has vetoed legislation allowing clergy to refuse performing gay marriage and protecting people who refuse to attend the ceremonies. The Republican rejected the bill on Monday, saying "I have examined the protections that this bill proposes to provide to the faith based community and I can find no examples of any of those circumstances occurring in our state." Deal said he would signed the bill had it passed in its original form, but he said other versions caused him concern. He said his decision to reject the bill was "about the character of our state and the character of our people. Georgia is a welcoming state; it is full of loving, kind and generous people."